Riley is now on day 6 of a nasty abscess. On Sunday June 21 he came in from the pasture three-legged lame. The farrier feels it is actually part of the same abscess he had in March. He's cleaned out a crevice that extends up his toe, and unfortunately "it's into the white line." Popular wisdom varies dramatically -- weather, improper trimming/shoeing, nutrition, bruising, poor hoof quality, etc. Veterinary resources seem so suggest that anything that compromises the hoof wall will allow bacteria into the hoof capsule, causing an abscess. 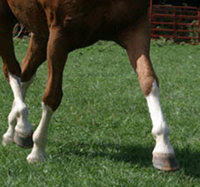 So while wet weather cause a spike in the number of abscesses in a particular geographic area, what makes an individual horse susceptible is a breach in the protective barrier of the exterior hoof. So it isn't exactly correct to say muddy pastures cause abscesses. People are sort of ho-hum about abcesses, but be careful! 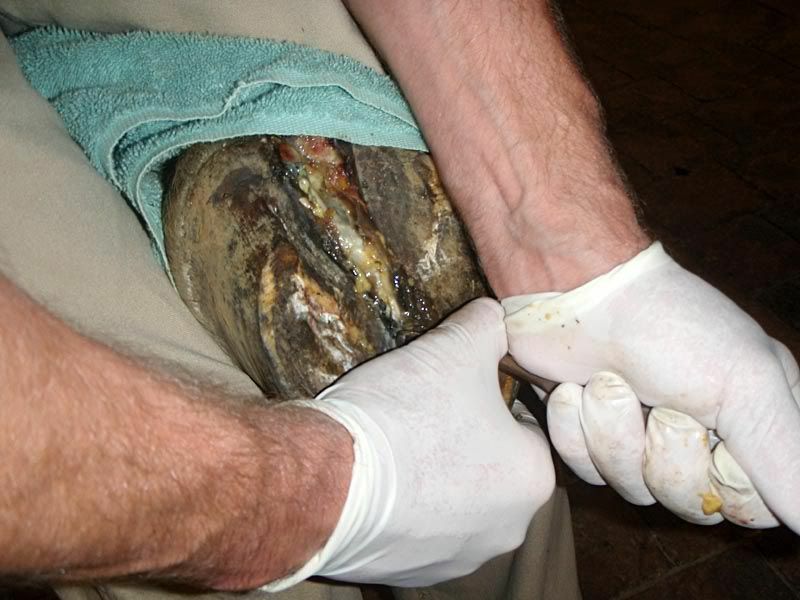 It's not terribly common, but abscesses can affect the internal structures of the hoof, and not in a good way. Recurring abscesses -- abcesses that occur in the same location -- may need advanced treatment, even surgery. I used to have a mare who would get repeated abscesses - the whole soaking bit gets pretty boring pretty quick. Fortunately, none of my 5 current horses has ever had an abscess in all the years I've owned them - now I'm probably jinxing myself! Oh, that's awful! I'm wishing for a speedy and thorough recovery for Riley. Yuck. My horse seems to get them around once a year (usually because he's overdue for a trim, AND we have a lot of mud) and even though he gets over them fairly quickly *knock on wood* it's still a pain to deal with. On the plus side, I have learned to make some nearly-invincible hoof wraps over the years. Hopefully Riley heals up soon! Wow, this is such a coincidence. My horse just went lame a day or two ago and the farrier just confirmed last night that she had and abscess. I feel so bad for her. Usually she is so excitable that I sometimes have trouble controlling her. It's terrible to have to watch her struggle to move and limp instead of galloping around the pasture. I really hope that both she and Riley get better soon. Thanks for the additional links, this is the first time my horse has ever been lame and they helped explain it a little bit more. Oh lord. I feel like I know hoof abscesses inside and out - treat at least 3 every year. I'm so sorry Riley has one. They take so dang long to heal/treat, and are so painful in the early stages. Wishing you the best. Jackson had an abscess 2 years ago that burst through the side wall near the coronet and I never knew he had it until I found the hole. He was never lame, favored that foot or anything. I immediately got the farrier out when I found that hole--it had no seepage, pus--nothing--and he told me to do nothing but keep an eye on it and let it grow out. As a new horse owner I was freaked out at the time, but there was never one indication until I found THE EVIDENCE! I got really lucky with that one it sounds like! Stacey...hi there. 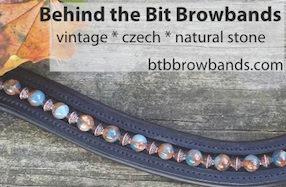 I follow your blog and want to pass on a bit of info. We have a mare who has been lame, and also had a crack up her front left hoof, not related says farrier. For 5 years we have fussed, tyring most everything, mare in good spirits, just not quite right, basically retired. THEN...I followed your link to the barefoot trimmers site, and voila saw my mares foot! Since then she has had her foot soaked 3 times a week, and she is 100% sound. Thankyou ever so much. I feel horrid at having put this poor dear through so much for so long for no reason except ignorance. I had a mare, when I was a teen, who got an abscess. We think she stepped on something in the field, but we never found the object. I not-so-fondly remember soaking her foot in buckets. We used diapers and duct tape for "booties". Very old school I guess. Now I'd just buy soaking boots and such. Fortunately, it was a one time abscess and she was fine after.